Bethesda Softworks' campaign to incrementally squeeze money from The Elder Scrolls IV: Oblivion players has been a huge success. So much so that offering up downloadable horse armor wasn't the flop it should have been. 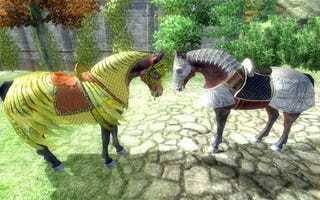 In fact, the infamous "Horse Armor" download for Oblivion, released in April of 2006, ranked ninth on the top ten downloadable content packs as of whenever Bethesda decided to stop counting. The good news for fans of dressing their horsies is that, according to Bethesda's Ashley Cheng, the pretty little suits of equine armor continue to sell daily. For the full list, read on. Why is "Fighter's Stronghold" dead last? Cheng notes that the list ranks purchased downloads. It was, at certain points, given away as a free download.